In Minnesota, Drosera linearis is one of a small group of rare plant species that are restricted to high-quality, undisturbed examples of a peatland type called patterned fens (Wheeler and Glaser 1979). These fens tend to develop at the core of large peatland complexes in northern Minnesota. Such complexes are part of extensive hydrological systems that can cover vast areas, and they are surprisingly sensitive to disturbance. A disruption or diversion of water movement anywhere within the system can have unintended consequences to the unique community of plants existing at the core. For this reason, D. linearis was listed as a special concern species in 1996. The habitat preferences and distribution of D. linearis follow a pattern similar to D. anglica (English sundew), but it appears to be somewhat rarer and more restricted geographically. It should be noted that there is a record of D. linearis from Hennepin County based on three 19th century herbarium specimens, which are labeled "Minneapolis". Although the specimens are correctly identified, there is some doubt as to whether they were actually collected in Minneapolis given the improbable occurrence of potential habitat. Certainly there is no potential habitat remaining in Hennepin County today and as a result, the record is not included on the state range map. Like all sundews, D. linearis is a small, inconspicuous plant with one outstanding feature; the leaves are covered with mucilage-tipped tentacle-hairs that are adapted to trap insects. When trying to distinguish this species from the 3 other species of sundew in Minnesota, you will need only to consider the shape of the leaf. As the name suggests, the leaf of D. linearis is narrow (only about 2 mm (0.08 in.) wide) and linear-shaped. That is, the margins of the leaves are straight and parallel to each other. All of the other species of sundew that occur in Minnesota have leaves with margins that curve to a greater or lesser extent. The leaves form a basal rosette, and have a distinct petiole 3-7 cm (1.2-2.8 in.) long and a blade 2-5 cm (0.8-2.0 in.) long. The stipule is about 5 mm (0.2 in.) long and attached (adnate) to the petiole. The flower stalk (scape) is 6-13 cm (2.4-5.1 in.) high and has 1-4 small white flowers. The seeds are black, oblong-obovoid to rhomboidal in shape, and 0.5-0.8 mm (0.02-0.03 in.) long (Wynne 1944). 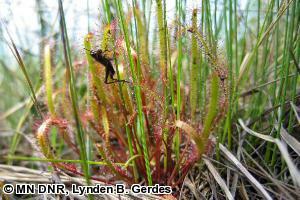 In Minnesota, D. linearis occurs exclusively in fens of open peatlands, primarily in water tracks in the interiors of large peatlands. The habitat is dominated by fine-leaved sedges such as Carex lasiocarpa ssp. americana (fen wiregrass sedge) with scattered low shrubs and stunted Larix laricina (tamarack) or Picea mariana (black spruce). These are very wet sites with subtle mossy hummocks and open peat-bottomed pools. The surface water is weakly acidic with a pH ranging from 5.6-7. The groundwater is near the surface and stable throughout the year (Minnesota Department of Natural Resources 2003). Historically, these sites experienced occasional wildfires (evidenced by fragments of charred wood in the peat), but the interval between fires was probably decades or centuries. Severe droughts were probably as infrequent as fires and of short duration. In other words, these peatland habitats have been remarkably stable over many centuries, and their continued existence is not disturbance-dependent like prairies or certain types of forest communities. The most unusual aspect of the biology of D. linearis is its ability to actively capture and digest small insects. When an insect of appropriate size lands on a leaf of this species, it becomes stuck on the sticky glandular hairs and the leaf slowly curls around the prey until it is fatally trapped. This is presumably a way for the plant to obtain fixed nitrogen, which is a limiting nutrient in peatland habitats. The flowers are evolved for insect-pollination, although self-pollination does occur. The seeds have no specialized dispersal mechanism and probably move about on subtle currents of the surface water. A sterile hybrid between D. linearis and D. anglica has been reported in Michigan (Schnell 1995). The best time to search for D. linearis is when the leaves are fully developed from June through August. The conservation and management activities that would most benefit D. linearis tend to be habitat-specific rather than species-specific. In other words, if the function and integrity of the fen habitat in which D. linearis occurs is maintained, then D. linearis should flourish. This is perhaps easier said than done. The particular fen habitat type occupied by D. linearis is dependent on very specific patterns of surface and subsurface water flow that are easily disrupted. Even the slightest disruption or alteration to the broad-scale hydrology that feeds the fen can have severe and irreversible effects on the habitat and the flora. Numerous examples of this have been seen, especially related to peat mining, rice cultivation, and road building. For this reason, any analysis of the impacts of land alteration projects within the watershed of a fen must involve a sophisticated understanding of the regional hydrology. Most of the areas harboring D. linearis are large, remote, water-logged peatlands that have traditionally been considered worthless wastelands with no potential for economic development. For this reason, they have generally remained in public ownership with little pressure from extractive or consumptive users of natural resources. That changed however, in the 1970s when high energy prices triggered a search for new energy sources. Energy companies soon realized that peat could be turned into natural gas and proposed to mine the peat from Minnesota's largest peatland. Although it was eventually deemed uneconomical, the prospect of Minnesota's peatlands being drained and mined alarmed land managers and conservationists. As a result, the core areas of most large peatlands in the state have been designated as Scientific and Natural Areas, which should provide a high level of protection. Schnell, D. E. 1995. A natural hybrid of Drosera anglica Huds. and Drosera linearis Goldie in Michigan. Rhodora 97:164-170. Wynne, F. E. 1944. Drosera in eastern North America. Bulletin of the Torrey Botanical Club 71(2):166-174.